The wait is over. After speculating since August, Rupert Boneham made it official in an afternoon press conference today at the American Legion Post on Holt Road. Rupert is, in fact, going to be seeking the Libertarian Party’s Nomination for Governor of Indiana. This comes as no real surprise to people who have been following the story. Most indications since Boneham formed his exploratory commission in August have been that this would be his decision. When the announcement was made almost a week early that today’s press conference would be taking place, it left little doubt. The local news even covered the story as fact as early as yesterday. 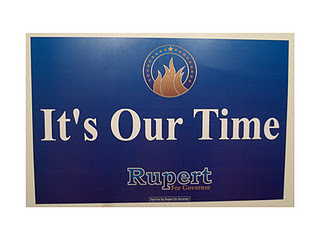 Rupert was introduced by his campaign manager, Evan McMahon, and by Indianapolis City-County councillor Ed Coleman, who represents more constituents than any other Libertarian in the nation. In his press conference, Rupert stated he is dedicated to bringing jobs to Indiana by creating a level playing field for all businesses, be they large, small, or home-based. He stated he is a believer in unions, is currently a union member himself, but also supports right-to-work legislation. Because of the way state laws are written, Libertarians are not allowed to participate in the primary process. Instead, they choose from their candidates at party nominating conventions each spring. As of now, Boneham is the only person who has announced they are seeking the Libertarian’s gubernatorial nomination.